Christy Clark says The BC Jobs Plan is working and remains a sound strategy for our economic future. Oh really? For whom is it a sound strategy? Let us look at some numbers. 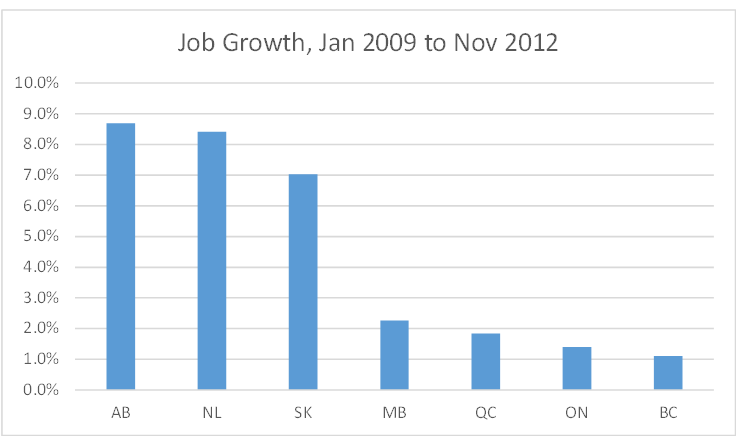 Over the last four years, BC ranked 7th in job growth, by percentage. 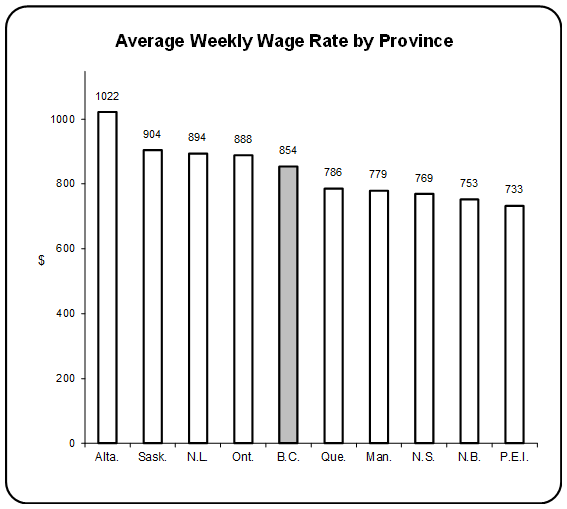 More alarmingly, average weekly wages in this province have been declining steadily. In 2012, BC ranked fifth. When NDP Premier Glen Clark left office, BC ranked second behind Ontario in average weekly wage. 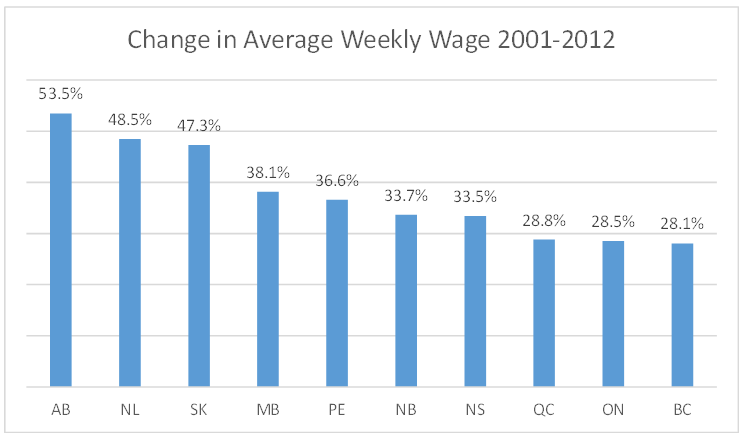 Under the Liberals, the province slipped to fifth position but the rate of change in weekly wages has been tenth of the ten provinces, between 2001 and 2011. I believe the Liberal economic plan is working exactly as designed. Their big business sponsors want this province to become a low wage economy, excepting, of course, senior bureaucrats and business leaders. That is the objective and the plan is working. Norm in the late 70's I was reading the newspaper (they were mildly relevant then) about Auto manufacturers negotiating with governments in the southern US. They wanted tax incentives and of course low wages. GM got it in Tennessee. They built the Saturn plant. Well guess what? Even that couldn't save GM. You could read about other companies doing the same thing. Then came the Free Trade agreement with the US. All of a sudden Canadian companies were rushing to move their manufacturing facilities there. It occurred to me at that time that if this kept up, the middle class in Canada would disappear and who would be able to afford to buy the products. Then the rush started for China. Since all of this began, prices have not decreased but increased and since China, quality has decreased. In our race to the bottom the elite have forgotten that if you produce something for sale, you have to have someone who can buy it. We are seeing the results of their illogical thinking. The worst part of all this is, we keep electing the corrupt governments that support this race to the bottom. Hopefully we in Canada have woke up. There are two elections coming up for British Columbians, provincial and municipal. We have a great opportunity to start the change for the better for the rest of Canada. Then we can truly say “Canada Starts Here Without Corrupt Governments”. The “Change in Average Weekly Wages 2001-2012 fits right in with what my son said to me just last week. He returned to Vancouver in November after 10 years out of the country. He said he was stunned by how much the cost of daily living had gone up and how little wages had moved in the 10 years he had been gone. Since returning, he has encountered numerous people who have to share living costs with others just to survive on Vancouver’s working wages. We’re talking four people sharing a 2 bedroom apartment. Unheard of 10 years ago. The big growth in wages is in the oil-producing provinces. But the tar pits don't seem to be good for Alberta, they have a big deficit. Plus the environmental costs. Low growth in wages is not necessarily so bad in itself, except that we have inflation, particularly in things like the price of housing. The Govt likes some inflation, because it makes our massive debt appear smaller. We just lost the penny due to inflation, which has made the penny almost worth nothing. Well well… in truth this is what the whole mess is about. Lower wages, servitude, no unions, less and less regulation…pure profit. The graphs tell the tale. One could write a thesis on the kleptocrats here in BC, how to rip off a population and get away with it…almost. The Real Truth…since Reganomics and the push to lower western standards of living, its always been about the workers. More education… less wages, Reduce manufacturing to service sector and tourism…lower wages. Increase the financial, real estate and government side of the equation, lower wages for the workers..and oh, jack their taxes and user fees while your at it. Sooner or later the “money suckers” will bankrupt us all. Solution? You tell me… anywhere else things would get quickly out of hand, if they already have'nt started to here. when people aren't making enough money to cover their costs they have no money to purchase anything but the bare essentials. we have only to look at the lay off at Sears and the closing of Best Buy stores. The 1%ers can not make an economy work. For that you need a lot of people making a decent living with some money to spare. We have joined the race to the bottom, but in a lot of ways it is our own fault. Too many of us, and I include those that reside in the USA and other countries, have rewarded the multi-national companies that shifted their manufacturing from our jurisdictions to countries that provide slave labour. Their production costs were reduced so dramatically that the cost of transporting the raw materials to these jurisdictions and the finished products back to us still increades their profit margins simply because they still priced their products as if they were produced at home. I know that other factors are in play but even today we see lineups to buy the newest Apple gizmo or designer sneakers which are all manufactured in some offshore sweat shop. This has got to stop. Hi Norm…just noted your by-lines at the top of the page, Bill Good and the BC Liberal Ladies Auxilary comments. Guess they really don't get it after all. This upcoming election, will be fought with far more relevant information in the blogs than in the MSM. If stupidity were a crime Bill, and all others connected to the BC Lib's, would get a life sentence. They have been “caught” in a game of deception, and now will pay a heavy political price, and perhaps more pointedly a legal one, once the scandals of this “arrogant” government, are properly investigated. Your methods are working, all of us appreciate the candor and truths, found in the information you provide.